‘It’s jungle country down there, mate.’ These were the words of a hip surgeon relative of a physio friend of mine when referring to an area of the body known as the femoral triangle. The rationale for this comment was variabilities in local anatomy from person to person can make it very difficult to consistently predict the location of sensitive structures between individuals. The challenge with a lot of hip and groin pain is that there are a lot of structures that can refer symptoms to the area which can lead to subsequent overload of inhibited structures. Within any injury or pain system, whilst there may be a single causative factor or structure it is often the case that there will be an element of affect across muscle and tendons, joints, the nervous system and some connective tissue. 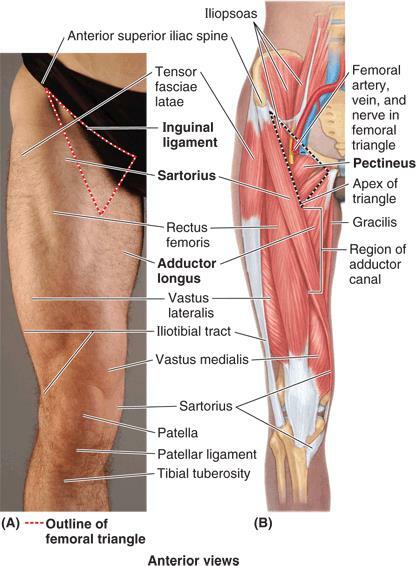 Within the groin, there are many muscles, both big and small that affect the hip joint and many nerves and blood vessels that pass through the area to supply the lower limb. Keeping these muscles in balance is part of the approach, however it is often not as straightforward as that. An often-reported problem for people with groin pain is that they have tight hip flexors. This is all well and good, however it doesn’t explain either why they are tight or what to do about it beyond stretching. Whilst tightness in the front of the hip can be common in groin pain, there might be good reason why this is an overriding finding in that they are often overloaded. One of the major hip flexors (psoas major) originates from the front of the lumbar spine. With poor abdominal control, they are in a good place to offer some stability to the front of the lumbar spine. Often addressing abdominal muscle control and timing is enough to offload these muscles. However, during my time working with elite athletes, we found many of the sprinters would complain of groin pain which we attributed to these mystical tight hip flexors, so we worked on the gluteals and hamstrings which we found were often inhibited. Our problems didn’t get any better until someone suggested that perhaps the hip flexors were weak and needed some strength work alongside appropriate abdominal work. After starting this approach our groin pain reports dropped significantly. Much like the shoulder (another interface between limb and torso), the hip and groin areas are complex areas that are links between areas requiring controlled stability and movement. Restoring control of the trunk and effective timing of abdominal musculature can allow pain related to overloaded structures to settle and start to regain balance within this area. Paul is our hip & groin specialist - if you'd like to book an appointment with him please call us on 02030 12 12 22 or email us on info@physioremedies.com.